Across from the State House resides a notable and significant bronze sculpture. 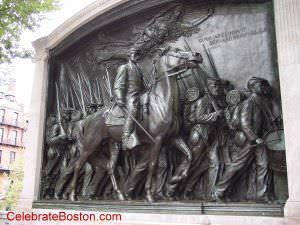 It is a memorial to Colonel Robert Gould Shaw and the 54th Massachusetts Colored Regiment. The 54th was the first unit in the Union Army made up of free Black soldiers in the Civil War. They fought with great honor and bravery, as did so many in that conflict. Their story was told in the movie "Glory" with Mathew Broderick. The bronze work is by the famous sculptor Augustus Saint-Gaudens. It is inscribed in the field, "Omnia relinquit servare rempublicam," which translates to "He relinquished everything to serve the Republic." "Opposite the State House, St-Gaudens' masterpiece, a labor of love upon which he worked for 14 years. Occasionally setting it aside for more remunerative pieces, this grew so elaborate under his work that the $13,000 he was paid, was very little money for the labor. But he kept on for love of it until it came to the nearest to his idea of anything he ever did. Shaw was a fine young Bostonian, of excellent family who left his bride to take command of colored troops when such act would have caused his execution if captured. He was shot at the head of his troops." Colonel Robert Gould Shaw's Regiment was assembled in March through May, 1863. In July, the 54th was defeated at Fort Wagner in Charleston, South Carolina. The regiment stormed the fort up a steep sand embankment, with Shaw at the head of his troops. Colonel Shaw was shot in the heart and killed. He was stripped and buried with his fallen troops in a trench outside the fort, which his family considered a great honor. Another act of honor, long after the Civil War, is also noted here. Alan Wesley Muckenfuss was a defender at Fort Wagner. He had left his wife, children, and job as a teacher, to enlist in the army just after South Carolina's Secession. Due to distinguished service, Muckenfuss was promoted to Lieutenant prior to the important battle at Fort Wagner. Years after the war, Muckenfuss was First Officer of the United Confederate Veterans Chapter in Charleston. According to A Brave Black Regiment, by Luis F. Emilio, the highest ranking officer in the Mass 54th after the attack on Fort Wagner: "[Shaw's] silk sash was purchased in Battery Wagner from a private soldier, by A.W. Muckenfuss, a Confederate Officer, who, many years after, generously sent it North to Mr. S.C. Gilbert of Boston, for restoration to the Shaw family." The sash was presumably returned to Robert Gould Shaw's widow, whom never re-married. Boston was an incubator for the abolitionist movement in the first half of the 19th century. The Museum of African American History is on Beacon Hill in the old African Meeting House. In 1832, William Lloyd Garrison established the New England Anti-Slavery Society there.